Here are some random facts about Chronic Pain in America. Interesting? Well, I think so! 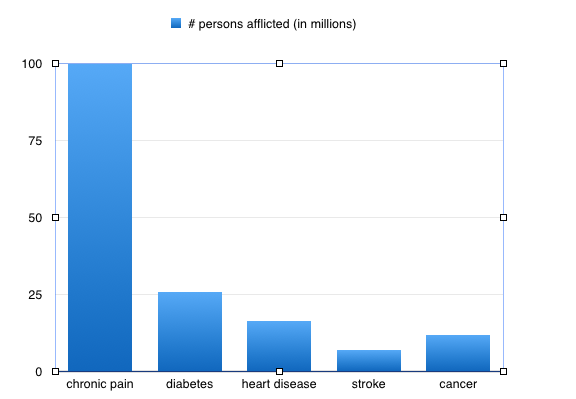 More Americans suffer from chronic pain than many other chronic illnesses? It is estimated that about 100 million citizens are afflicted by chronic pain. Compare that to 25.8 million Americans who have diabetes, 16.3 million with heart disease, 7 million stroke victims, and 11.9 who have cancer! The cost of health care related to chronic pain, including medical costs and lost wages is somewhere between $560 and $635 billions dollars per year (expressed in 2010 dollars). This is approximately $2000 per person including all persons in the US. Lifestyle adjustments that are made to deal with chronic pain include taking disability leave from work, change of career, obtaining assistance with activities of daily living, and moving to a home that is easier to maintain. Overall, workers who were surveyed in one study lost an average of 4.6 work hours per week due to a pain condition. Approximately 20% of all Americans report that pain disrupts their sleep at least two or three times per week. Common chronic pain conditions include arthritis pain, cancer pain, low back pain, headache, and neuropathic pain. According to the 2006 Voices of Chronic Pain Survey, more than half of those responding said that they feel they have little to no control over their pain. Approximately 3 out of 4 respondents reported feeling depressed. Thirty eight percent of those who responded to a 2003 survey "Pain in America" reported that they had been to more than one health care practitioner regarding a painful health condition. 2009 Health and Human Services survey reports that women were more likely than men to experience migraine, neck, jaw,facial or low back pain. In the same study, it was reported that Asian adults were less likely than other races or ethnicities to report pain in the lower back.